Many who “believe” in the Bible try to just say that the flood was local, and that it wasn’t really a global flood, since that couldn’t really happen (or, so scientists tell them). There is only one thing I have to show you that would utterly destroy this theory. Copyright © Answers in Genesis, http://www.AnswersinGenesis.org. When we see that picture we see how ridiculous it is to believe that the flood was just local. 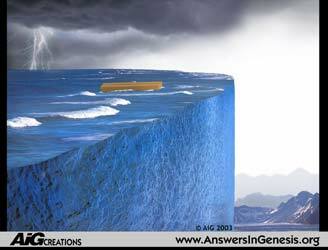 This picture would be perfectly accurate if God had made the flood local (even though He says it was global) because He said it went 20 feet over the highest mountains! That would mean some serious issues for Noah if he reached the “side” of the water. In Genesis 9:11-17 we read that God made a covenant with all of humanity that He would never send another flood like the one He had sent already. Well, if we believe in a local flood then we have a problem. You see, since Noah, there has been thousands, if not millions, of local floods that have devastated communities and killed thousands. Do you think, when Shem got caught in a flood later in his years, that he saw the rainbow and said, “Oh, God thank you for making that covenant. Now I know you are truthful!” No, he would not say that if God had lied to him. We have to trust the Bible as it says it, not as we think it. Also, if the flood was just local why did Noah have to take all those animals on the ark? He could have easily made the ark just big enough for him and his family and then march in and wait the flood out. If the flood was local Noah would’ve done this. But, it wasn’t local. And why would Noah stay there when he could just move to a different place and wait out the flood there? And, the people would have probably believed him if he preached it as a local flood and would have marched out with him. But, this is not the account we read in Genesis. When we read from the Bible the flood makes sense but when we read from man’s opinions it becomes a confabulated account!